If Mark Hamill gets his way, the president could be replaced with a princess -- on the Hollywood Walk of Fame, that is. Hamill took to Twitter on Tuesday to suggest President Trump's Hollywood star be replaced with one for his late "Star Wars" co-star, Carrie Fisher. "How about replacing it with someone who really earned it?" Hamill wrote, tagging Fisher's Twitter account. Hamill's suggestion for a change up comes after the West Hollywood City Council unanimously passed a resolution Monday night urging the removal of President Trump's star from the Hollywood Walk of Fame, CBS Los Angeles reports. The resolution calls on the Los Angeles City Council and Hollywood Chamber of Commerce to remove Mr. Trump's star "due to his disturbing treatment of women and other actions that do not meet the shared values of the City of West Hollywood, the region, state, and country." The president's star has been vandalized several times and completely destroyed twice, most recently last month by a man with a pickax. Mr. Trump received the star in 2007 for his work as a producer of beauty pageants and star of "The Apprentice." Fisher, who portrayed Princess Leia, died in December 2016 and does not have her own star on the Walk of Fame. When he heard that some wanted Mr. Trump's star gone, Hamill suggested his on-screen sister fill the space on Hollywood Boulevard near the El Capitan theater. Hamill has voiced his opposition of the president before. He has recorded audio of himself doing a Trump impersonation, reading the president's tweets in an unflattering, villainous voice. "Nobody writes better super-villain dialogue than #Trumputin! #KremlinCandidate," Hamill wrote on Twitter when sharing the audio last year. Last year, Hamill donated to a campaign to buy Twitter and ban the president from the social media platform. He also praised Robert De Niro's anti-Trump speech during the Tony Awards this year. 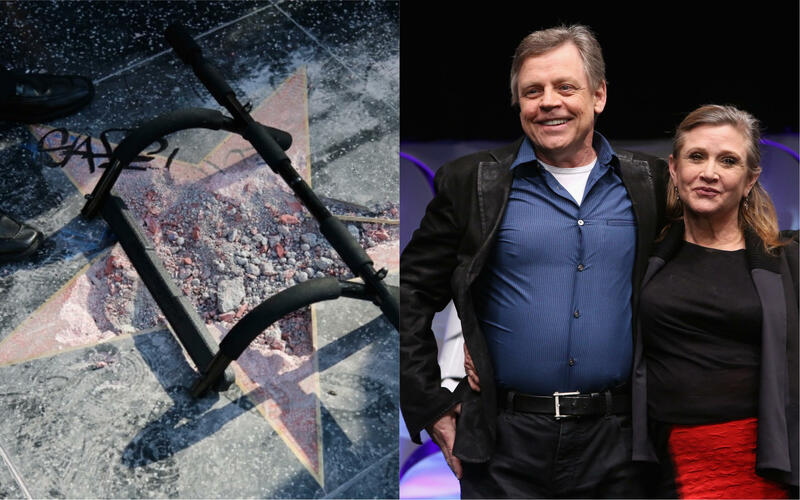 Hamill's tweet about replacing Mr. Trump's star received over 2,000 comments, including one from her friend, the writer Paul Slansky, who said Fisher "would have loved being the face of the Resistance!" Hamill seemed to confirm that, responding, "I heard her candid views on him in person... SCORCHING!"